FILE - A Prius is displayed by Toyota at an event in Las Vegas, Sept. 8, 2015. Toyota, under ambitious environmental targets, is aiming to sell hardly any regular gasoline vehicles by 2050, only hybrids and fuel cells, to radically reduce emissions. He and other Toyota officials insisted on the inevitability of their overall vision, stressing that the problems of global warming and environmental destruction made a move toward a hydrogen-based society a necessity. Experts agree more has to be done to curtail global warming and pollution, and nations are increasingly tightening emissions standards. But they are divided on whether all gasoline engines will disappear, or they'll stay on, thanks to greener internal combustion engines, as well as the arrival of clean diesel technology. Tatsuo Yoshida, senior analyst at Barclays Securities Japan in Tokyo, said Toyota's goals weren't far-fetched. "The internal combustion engine is developing and metamorphosing into hybrids," he said. "Toyota has been working on this technology for a long time. When officials speak out like this, it means they are 120 percent confident this is their scenario." Toyota Motor Corp. Chairman Takeshi Uchiyamada speaks during the 2015 Toyota Environmental Forum in Tokyo, Oct. 14, 2015. Toyota said it will develop manufacturing technology that uses hydrogen, and will use wind power at its Tahara plant, both by 2020. It also promised to beef up various recycling measures, including developing ways to build vehicles from recycled ones. When asked why Toyota remained so cautious on electric vehicles, they said they take too long to recharge, despite battery innovations that have made them smaller, restricting them for short-range travel in cities. 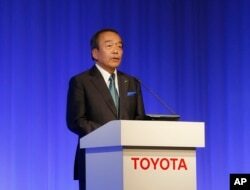 Toyota Chairman Takeshi Uchiyamada, known as the "father of the Prius," said the company was taking the environment seriously because it has always tried to contribute to a better society. "We have the same principles since our founding," he said, showing on stage a photo of Sakichi Toyoda, the Toyota founder's father, who invented a textile loom in 1891. "That is Toyota's DNA."